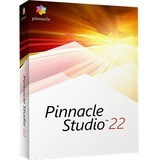 Bring out your inner editor with Pinnacle Studio™ 22, the most flexible and creative video editing suite for those new to Pinnacle. With everything you need to get started, explore Pinnacle Studio and create one-of-a-kind projects using themed templates or by editing your raw footage directly on the multi-track timeline. Enjoy features like multi-camera video editing, split screen video, and more. Tap into 1,500+ filters and effects and export your videos to disc, popular formats and devices, or online! Make movies that impress with Pinnacle Studio.